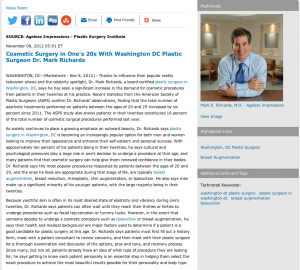 Washington, DC — Thanks to influence from popular reality television shows and the celebrity spotlight, Dr. Mark Richards, a board-certified plastic surgeon in Washington, DC, says he has seen a significant increase in the demand for cosmetic procedures from patients in their twenties at his practice. Recent statistics from the American Society of Plastic Surgeons (ASPS) confirm Dr. Richards’ observations, finding that the total number of aesthetic treatments performed on patients between the ages of 20 and 29 increased by six percent since 2011. The ASPS study also shows patients in their twenties constituted 16 percent of the total number of cosmetic surgical procedures performed last year. As society continues to place a growing emphasis on outward beauty, Dr. Richards says plastic surgery in Washington, DC is becoming an increasingly popular option for both men and women looking to improve their appearance and enhance their self-esteem and personal success. With approximately ten percent of his patients being in their twenties, he says cultural and psychological pressures play a large role in one’s decision to undergo a procedure at that age, and many patients find that cosmetic surgery can help give them renewed confidence in their bodies. Dr. Richards says the most popular procedures requested by patients between the ages of 20 and 29, and the ones he feels are appropriate during that stage of life, are typically breast augmentation, breast reduction, rhinoplasty, chin augmentation, or liposuction. He also says men make up a significant minority of his younger patients, with the large majority being in their twenties. Because youthful skin is often in its most desired state of elasticity and vibrancy during one’s twenties, Dr. Richards says patients can often wait until they reach their thirties or forties to undergo procedures such as facial rejuvenation or tummy tucks. However, in the event that someone decides to undergo a cosmetic procedure such as liposuction or breast augmentation, he says their health and medical background are major factors used to determine if a patient is a good candidate for plastic surgery at this age. Dr. Richards says patients must first fill out a history form, meet with a patient consultant to review concerns, and then meet with their plastic surgeon for a thorough examination and discussion of the options, pros and cons, and recovery process. Since many, but not all, patients already have an idea of what type of procedure they are looking for, he says getting to know each patient personally is an essential step in helping them select the exact procedure to achieve the most beautiful results possible for their personality and body type. Regardless of how old a particular patient is or what stage of life they are in, Dr. Richards says selecting a board-certified, highly-trained plastic surgeon should be the number one priority for anyone considering aesthetic procedures, whether considering a breast augmentation or rhinoplasty. He encourages all patients to consult with a dedicated and qualified practice before undergoing any treatment. Through partnership with the right plastic surgeon, Dr. Richards says patients in their twenties can enjoy a healthy, beautiful appearance with long-lasting results and brimming self-confidence that matches their inner youth. Dr. Mark Richards is board-certified by both the American Board of Surgery and the American Board of Plastic Surgery. He is a graduate of Yale University and the University of Maryland School of Medicine. Dr. Richards completed two years of residency in plastic surgery and five years of residency in general surgery. In addition to giving lectures internationally covering a number of topics, he has published several articles that have been featured in prestigious medical publications such as the Aesthetic Surgery Journal. Dr. Richards has been recognized as of the of the Best Cosmetic Surgeons in the U.S. by many publications, including The Washingtonian and has been listed since 2002 in the Consumer’s Research Council Guide to America’s Top Surgeons. Located at 11300 Rockville Pike Suite 912 in Bethesda, MD, Dr. Richards’ practice, Ageless Impressions – Plastic Surgery Institute can be reached at (301) 468-3458. Dr. Richards and his team can also be contacted online via the websites plastic-surgeon.us, faceliftusa.com, myhormonetherapy.com or facebook.com/drmarkrichards.